Over the fortnight I have been in Paris I have been gobsmacked by the driving ability of the motorists. It gives a whole new meaning to the words “bumper bar” when you see them get in and out of car parks. 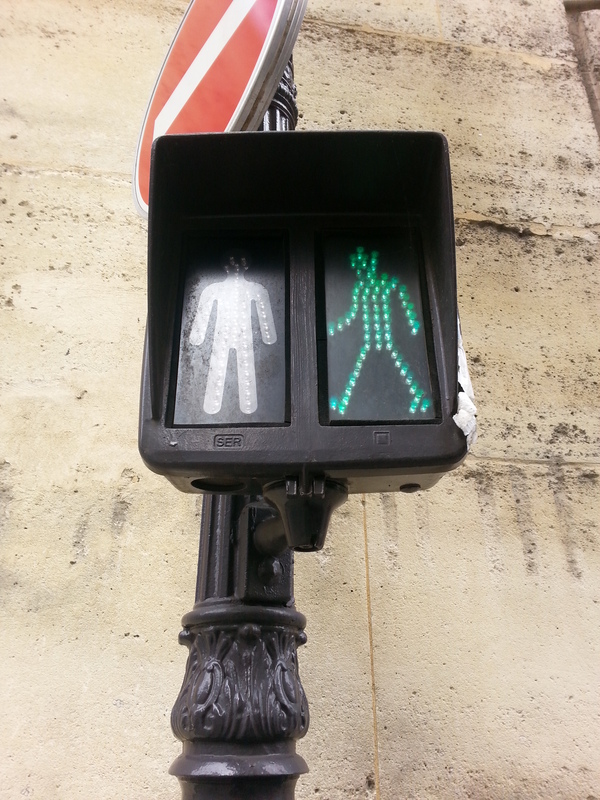 I had come to my conclusion that the Red man on the traffic light means. If you are arrogant and/or brave enough just go. and that the green man means RUN! “This is what happens: You arrive at a square to find all the traffic stopped, but the pedestrian light is red and you know if you venture so much as a foot off the kerb all the cars will surge forward and turn you into a gooey crepe. So you wait. After a minute, a blind person comes along and crosses the cobbled plain without hesitating. Then a ninety year old lady in a motorized wheelchair trundles past and wobbles across the cobbles to the side of the square a quarter of a mile away. It is an incredibly funny book well worth reading. Brilliant posts Bron. I love Bill Bryson. He is LOL funny. In terms of suggestions for what to do : musee de Cluny on the left bank is great . It has those lady and unicorn tapestries. Then go to rue de buci for food or to rue mouffetard a but further. Good food shops. The army museum is really great even if you’re not into war that much. Napoleon ‘s tomb is there.